The Coliseum was home to the greatest warriors in all of history, we are, of course, talking about the mighty gladiators. You don’t just become one of these phenomenal fighting sensations overnight. No, no, no, you need years of training, nearly a lifetime! So it may be too late for you to join the ranks of the elite but not for your little bundle of joy. Grab this Infant Gladiator Costume and let the training begin! Once you dress your little one up in this adorable costume he will not only look as cute as a button but as ready for battle as the greats. This costume comes with a jumpsuit designed to look like some fierce warrior attire. On the breastplate lies the emblem of the lion, one of the mightiest beasts in the world. It is designed this way because we know your little gladiator will have the strength and the heart of this big jungle cat on the battlefield! Along with this awesome one piece, this costume set also includes the gauntlets and the headpiece you see depicted on our model. If you want to take things a bit further then grab your baby a pair of Roman inspired sandals and maybe even a foam sword and shield set! 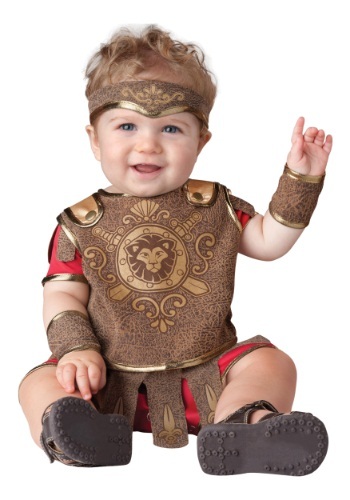 Once he is fully equipped, his training can commence and you can set your kiddo on course to being the greatest gladiator the world has ever seen. Before you know it you'll be receiving messages from Roman officials cordially inviting you and your youngster to fight in the actual Coliseum!